The 24 Hours of Daytona is murder in more ways than one. Kate Reilly, a professional race car driver and amateur detective, never expects to slip into that second role while running the 24-hour endurance race as part of the Sandham Swift racing team. Before she can take her turn in the team’s No. 28 Corvette, the police inform her that her boyfriend, Stuart Telarday, was targeted by a hit-and-run driver who left him with life-threatening injuries. 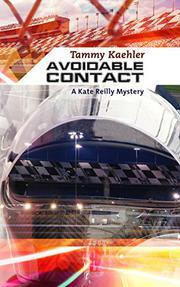 Kate joins her best friend and manager, Holly Wilson, in search of information that will identify the mystery driver. On the track, where seasoned professionals race alongside amateurs, the wrecks pile up. One of them kills Kate’s teammate Ian Davenport in a suspicious accident. Kate tries to keep her mind on racing, but it’s hard for her to focus when her newfound race car driving uncle and two cousins seem to be at the center of the problem. Brought up by her grandparents, Kate only recently met her father, and except for him and her cousin Lara, she’s gotten a chilly reception from her relatives. Meanwhile, she’s also received texts from a reporter working on a story about wealthy Richard Arena, whose racing team is evidently cleaner than his other business interests. The carnage on the track is nothing compared to some of the back-stabbing and double-dealing in the pits. Kate has to balance her turns in the car with her investigation, which soon leads to a murder that can’t be written off as an accident. Kate’s third (Braking Points, 2013, etc.) will be a joy to racing fans hungry for inside dope. The mystery itself takes a back seat.